WAFFLES: Hey Boss? What happened to our TV Trip Saturday? What's with all this water? Is this supposed to be Baywatch or something? KATIE: Today's TV Trip spoof has been preempted by the dishwasher catastrophe in the kitchen. Seriously, Waffles ...BAYWATCH??? WAFFLES: Yeah but there's all kinds of water and stuff. And there's a cute girl cat. Did you see her? I hear she's still a KITTEN. KATIE: No Waffles, I was too busy darting in-between the guys wearing tool belts and carrying those giant vacuums and fans. You know, those guys you were hiding from? MATZOH: Uh, did someone say cute girl cat? Sometimes life just decides to take you on an unexpected turn. That's exactly what happened Friday afternoon when Glogirly came downstairs from the bedroom to discover Katie and Waffles sitting side by side on the kitchen rug staring at the dishwasher. That in and of itself is odd enough. But the tsunami like waves rushing out from under the dishwasher took odd to a whole new level. Panic level. So the Townhouse is currently under siege (and under water) as intruders wearing tool belts have been tearing up the hardwood floors, drilling holes in our walls and ceilings and scattering fans the size of small cars all over the house. Although the damage is well, immense... the good news is that everyone is safe, anything that's damaged is replaceable and we have insurance. Our usually clean and neat backgrounds we have in our photos will likely look more like a construction zone in the near future. 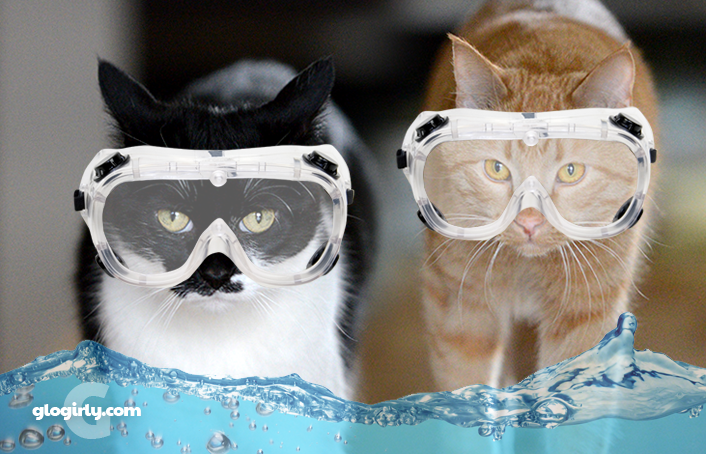 We'll have to trade in our goggles and flippers for some hard hats. Playful, affectionate, curious and sweet, it’s a mystery why this beautiful girl is still at PAWS. Young Matzoh gets along just fine with other cats. For some reason all the other kittens have been adopted, leaving Matzoh behind. She's such an affectionate lap kitten and can't wait to find her forever lap. Matzho is available for adoption at PAWS, Pet Animal Welfare Society in Norwalk, Connecticut. Every Saturday we're featuring adoptable cats from PAWS Pet Animal Welfare Society in Norwalk, CT. in our TV Trip blog series. Through the magic of Photoshop, they'll join Katie and Waffles for some time-travel adventures in our TV Trip blog series. 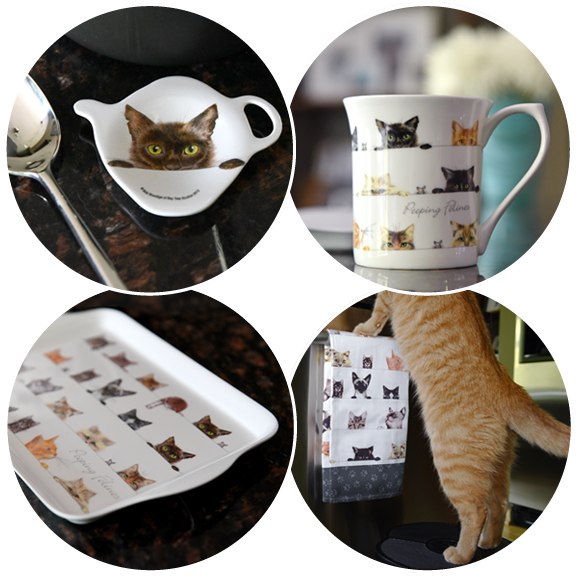 We'll also introduce you to the 'Cameo Cats' and share a little bit about them. Maybe, just maybe... our crazy antics will help our shelter friends find forever homes. Don't miss our latest giveaway from Georgia's Gifts! 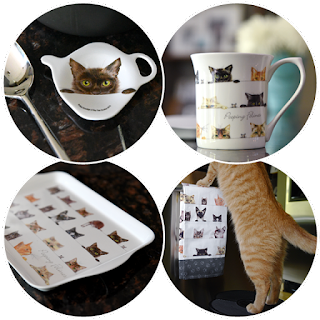 Enter to win a 4 piece prize package from the Peeping Felines Collection. Prize includes a tea bag holder, mug, tray and kitchen fowl. Sweet! I am just so glad you are all OK. This is something you didn't need with BlogPaws trip on the horizon, I know, but we hope things GO OK and you will all be alright. A dishwasher tsunami in your HOUSE?! That's awful! I hope it all gets fixed soon, and that the Glohumans don't faint from the bills! Wow, we are sure sorry that all of y'all have to deal with this. Glad everyone's ok. Hope things go smoothly! Hoping Matzoh finds her furever lap! Oh no, sorry about your flood. Hope it's fixed fast. But I do have some good news. I heard that Matzoh was adopted yesterday! We saw Baywatch and thought: ugh oh that's about your flood! I'm glad everyone is safe and the really important stuff is safe too. I would have loved to see Katie and Waffles staring at the tsunami from the dishwasher! Did your neighbors get water, too? I live in an apartment and know how that goes. 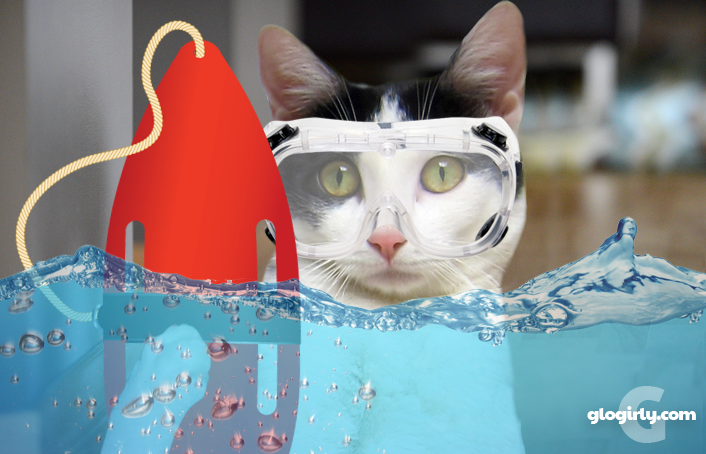 Matzoh is very adorable, I hope you can pack away your waterwings very soon. We are glad everyone is OK! But we know this will not be an easy quick fix. Oh no, that's awful! I am glad everyone is all right. That is good news that Matzoh has been adopted. What a mess...so happy everyone is safe but what a horrific mess. Water is so, so destructive. 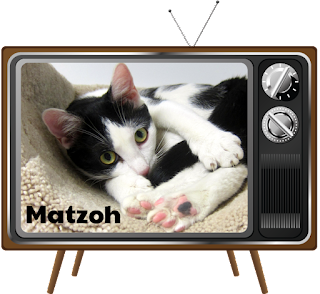 Wonderful news about Matzoh...what a cutie pie!!! We can imagine Waffles leaping of the counter like a diving board, yelling "CANNONBALL"!!! Oooh, I suppose this means Waffles will want a hard hat? Hope things dry out really soon and nothing is totaled!. Oh dears, a flooded floor. That happened in our dungeon, so nothing got wrecked and only the floor was wet. That definitely does not sound good. It sounds like a water supply hose burst and that's never good. I suppose the best thing that can be said is everyone is okay and that Glogirly was home and not out. I’m sorry this happened to you. It could have been worse if it happened while you were at Blogpaws and Gloman was out too. TW knows where our water shutoff is but she’d have to remove 80 lbs of cat litter to get at it. Hope everything is back to normal soon. Not fun guys..I hope everything is fixed for you soon..Concats to Motzoh for getting her forevers home..
Oh no! All that water sounds just awful! Hope it all gets back to normal soon. Happy Mudders day to yous mommy.